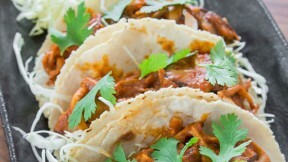 These braised mushroom tacos are quick and easy. Food blogger Marc Matsumoto explains how to avoid the usual time-consuming aspects of this recipe in a full post on the Fresh Tastes blog. Place the onions and 1 tablespoon of olive oil in a sauté pan and fry over medium low heat until caramelized (20-30 minutes). If you have frozen caramelized onions you can skip this step. Use scissors to trim the tops off of the dried chilies then cut them from end to end so you can open them up. Remove all the seeds and membranes inside the chilies. Place the chilies in a bowl and cover with the boiling water. Let them soak for 15 minutes. While the chilies rehydrate, prepare the Eryngi mushrooms by cutting off the caps and using your fingers to pull apart the stems into thin shreds that look like shredded chicken. Slice up the caps along with the shiitake mushrooms. Drain the chilies and transfer them to a food processor along with the caramelized onions, tomatoes, tahini, and water. Add the remaining 2 tablespoons of olive oil to the sauté pan, and put over medium-high heat. Add the garlic, cumin and cinnamon. Fry until fragrant, then add the mushrooms and salt. Sauté until the mushrooms have browned. Strain the chili mixture through a sieve into the pan and turn the heat down to medium low. Simmer until the sauce is very thick. Adjust salt to taste. Serve with warm tortillas, shredded cabbage, cilantro and lime wedges.